We at the Tales [i.e., me] would like to wish a very Happy and Blessed Mother's Day to all. On a personal note, my sister Susan and my brothers Sandy and Brad continue to always remember the blessing of our Mom, Reenie, who is in heaven with our "Pop" and God. Reenie, who was born on the 4th of July and died on Christmas Day, was a wonderful human being, loved by everyone because she loved everyone. She made the best apple pies in the world. Her beautiful paintings still are on view to see at each of our houses. We love you forever, Mom. I am also blessed to have a wonderful wife, Sheralyn [the fetching Mrs. B] who is also a great Mom. Tonight, Saturday, May 9, 2015, Sheralyn and I will once again be attending Jones Hall to hear our world class Houston Symphony Orchestra, with our world class Maestro, Andres Orosco-Estrada, as this 2014-2015 concert season is coming to a close. It is certainly not coming to close with a whimper but with a bang as one of the great violin concerti in the repertoire, the Beethoven Violin Concerto in D-Major, will be performed. Bela Bartok's stirring Concerto For Orchestra closes out the concert. As the Houston Symphony Orchestra site states, "experience the incredible virtuosity of each instrument in Bartók’s Concerto for Orchestra." In my opinion [and I want to emphasize, unprofessional opinion], the top 4 Violin Concertos ever composed are the 1. Tchaikovsky, 2. Mendelssohn, 3. Brahms and 4. Beethoven concertos. So, my wife and I will be experiencing greatness tonight in Jones Hall on this Mother's Day eve. So, on this special Classical Music weekend to honor Mother's Day, please turn up your volume to hear one of the greatest violin concertos ever written by the master, Ludwig Van Beethoven. Thanks for this wonderful video on You Tube from Ahmed Hermessi, featuring the great violin virtuoso Joshua Bell. Note: In this video you will notice that there is not a conductor on the stage, which normally means that the soloist, Joshua Bell is also acting as the conductor, but watching the video it doesn't look like he is conducting [although he does give a cursory glance every now and then to the orchestra, so I could be wrong], so I am assuming the concertmaster is acting as the director for the whole orchestra [and not just the strings]. Update: After coming home from a great evening at Jones Hall I wrote this on my FaceBook page: "Oh, the Beethoven VC was so magnificent with a great soloist James Ehnes-he was so good. We were on the first row right in front of the concert master-and heard the Beethoven like never before with the exquisite phrasing of the violins as interpreted by our great conductor Andres Orosco-Estrada--Andres is the best dynamic young conductor in the world in my opinion. 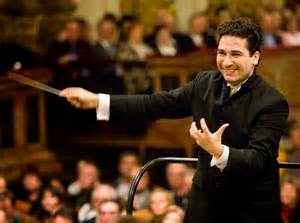 Sheralyn and I just love to watch Andres conduct. The joy from his faces oozes as he is performing-and the Houston Symphony Orchestra reflects that love of the music in their playing. Bravo, Bravo! I forgot to add, James Ehnes cadenza in the first movement was amazing. There were phrases you could hear three voices at once-if you closed your eyes and just heard that you would insist there were 3 violins playing-certainly 2 but no way could that sound come from 1 violin. Bravo! Thanks brother! A very Happy Mother's Day to Francine!